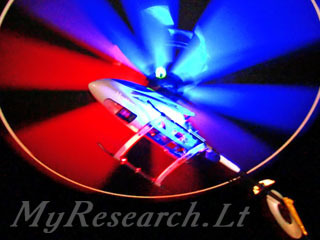 HeliStrobe device is installed in R/C model of helicopter and controls operation of lighting elements on the sides of the model. 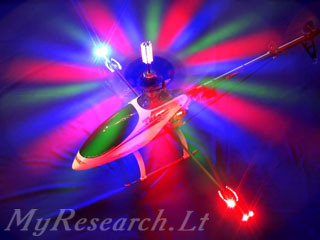 Lighting elements are bright LEDs directed towards the rotor and the body of the model. The sequence of flashes controlled by the microcontroller provides an image of an immovable figure formed by the rotor. The shape of the figure is chosen from 15 various versions. The image of the model brightly lighted in the both sides in night is the same as in daytime. A change of the colour of lighting causes a change of the colour of the model. 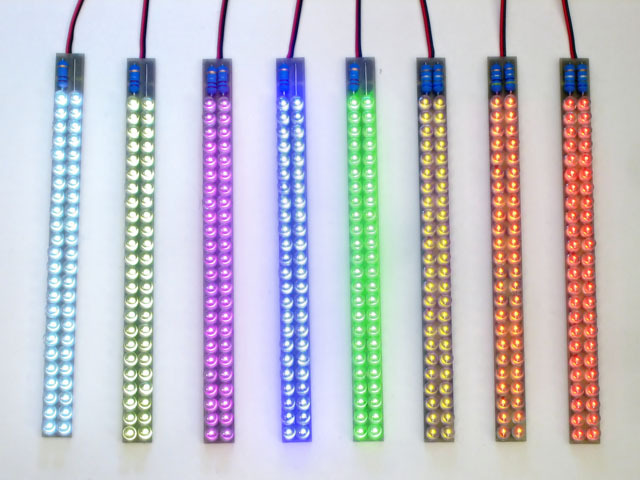 The bright LED's are used as the light-illuminating elements. The recommended total power of the diodes should be at least 10 W. Usage of the light-illuminating diodes of different colors changes the color of illumination of the rotor and of the body of the model. The ready-made blocks of the light-illuminating diodes, assigned for the fixed voltage, can be used. However, some of these blocks produce illumination, which is too dim, in spite of the fact that sufficiently powerful diodes are contained in them. By increasing the current, You will increase brightness of illumination of the diodes, but You will hasten their expiry date. If the current is too high, the light-illuminating diodes will firstly get overheated and afterwards will burn out. Extra cooling is necessary for certain powerful light-illuminating diodes. Such light-illuminating diodes can be tightly pressed to the metal components of the landing skid, which will diffuse heat. 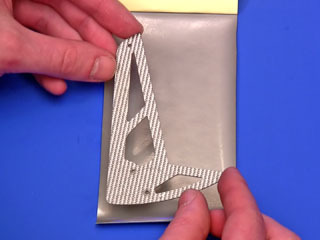 Seeking for better heat dissipation, it is necessary to grease the connection with the heat-conducting liniment or with the special glue or to use the heat-conducting pads. 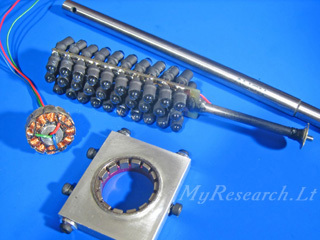 The information about connection of powerful light-illumination diodes via resistance is submitted in the manual of the gadget. It is more convenient to purchase the LED's in special shops, which sell radio-components. Using panels of 48 Flat Top diodes with 5 mm diameter was found to be the most convenient and economic solution. Dimensions - 161x12x8 mm, weight - 17 g. Power is supplied to the diodes via the single resistor. White - two diodes are connected in series, the resistance 0.2 Ohm, the pulse current 2.4A, the electric power 18W. Warm white - two diodes are connected in series, the resistance 0.0 Ohm, the pulse current 2.4A, the electric power 20W. Purple - two diodes are connected in series, the resistance 0.47 Ohm, the pulse current 2.4A, the electric power 17W. Blue - two diodes are connected in series, the resistance 0.2 Ohm, the pulse current 2.4A, the electric power 19W. Green - two diodes are connected in series, the resistance 0.2 Ohm, the pulse current 2.4A, the electric power 19W. Yellow - three diodes are connected in series, the resistance 1.2 Ohm, the pulse current 1.6A, the electric power 10W. Orange - three diodes are connected in series, the resistance 1.0 Ohm, the pulse current 1.6A, the electric power 10W. Red - three diodes are connected in series, the resistance 1.2 Ohm, the pulse current 1.6A, the electric power 10W. Visually, the brightest colours are white, blue, and green. Ultra-violet radiation may be used together with the fluorescent blades. It is advisable to install two panels on each side of the helicopters, attributed to the class 60-90. For feeding, a two-section lithium battery of at least 1000 mA/h capacity should be used. Do not connect the panels to the battery in absence of HeliStrobe device, because they will burn out soon. To the diodes of the said panels, currents of maximal values are applied and the supply should be pulse (it is ensured by HeliStrobe device). 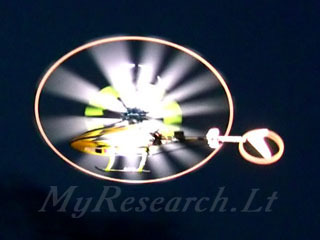 Seeking for illumination of the main rotor of the helicopter from above, it is necessary to fix the block of LED's over it.The feeding wires are let through the hollow axle with the purpose of installing the lighting elements over the main rotor of the helicopter. The brush collector is installed from below. The brushes of a small electric motor are used. The junction, meant for connection of the LED, is installed from above. The light-illuminating diodes, installed above the rotor, are fed from one of the outlets of the device HeliStrobe (parallel connection to one of the lateral lighting elements). 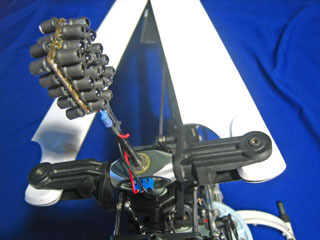 It is also possible to use the blades with the installed light-illuminating diodes so as to observe the plane of rotation of the screw propeller in the overturned condition. 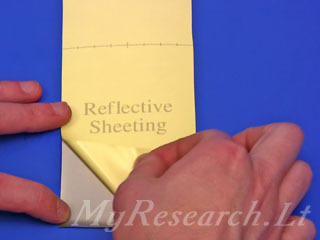 The demonstrative video-clip provides several examples of illumination and twinkling of the parts, pasted over with the light-reflecting film. The source of the twinkling light was fixed on the video-camera. 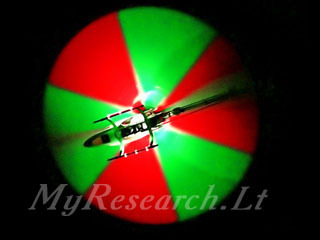 The demonstrative clip provides the view of the rotor of one of the helicopters, which is illuminated with the red-green symbol of "radioactivity". It is done in the following way. The green light-illuminating diodes are connected to the left canal of the HeliStrobe from the left and the red light-illuminating diodes - from the right. 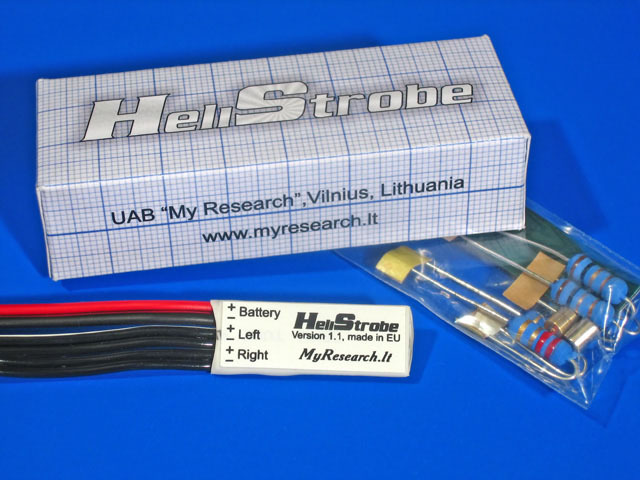 The green light-illuminating diodes are connected to the right canal of the HeliStrobe from the right and the red light-illuminating diodes - from the left. The double-color figure is achieved as the result of signals, coming to the left and right canals by turns. The first version of the gadget foresees usage of the optical sensor for synchronization with the rotor. The illuminated figure used to comply with the view on the disc, which was fixed on the gear. 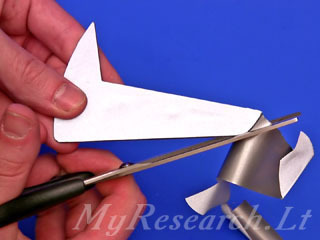 The number of strips on the disc was divisible by the transmission number for the tail rotor; the tail rotor also looks like a solidified figure for this reason. The second version foresees usage of the xenon lamps. The flash of the xenon lamp is very short; thus, the blades look like as if they are set in the place. The xenon lamps should be thoroughly handled; high tension should be available. The third version foresees illumination of the rotor with many-colored light-illuminating diodes. The light-illuminating diodes revolve together with the rotor. The three-phase generator of the current, fixed on the shaft of the main rotor, used to generate feeding for the light-illumination diodes. The number of the colored petals at the illuminated rotor is equal to half of the number of magnets in the generator. The micro-processor device serves as the fourth version. Small weight is typical of this version; it provides the possibility of selecting various figures, assigned for illumination of the rotor. All the above-specified versions of the gadget have been patented, but the non-commercial reiteration of the schemes by private persons is welcomed. The device is installed in the same body with a rotation sensor for the rotor. It should be installed under or over the gear fixed on the axle of the main rotor. A magnet is glued into the gear, and the sensor of the device responds to shifts of the magnet. The location of the sensor on the device is marked with the red sign. This plane of the device should be faced towards the magnet. The gap between the magnet and the sensor should be 2...4 mm. For fixing the magnet, a hole of 4 mm diameter is drilled in the gear. Before fixing the magnet with adhesive, a response of the sensor to it should be checked up; if it is absent, the magnet should be turned and its opposite end should be inserted. A metal cylinder is glued from the opposite side of the gear, seeking for the balance preservation; its diameter is identical with the magnet. 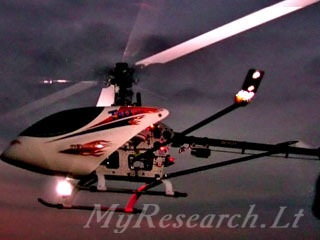 The sensor and the magnet should coincide when the main rotor's blades are oriented along the body of the helicopter. 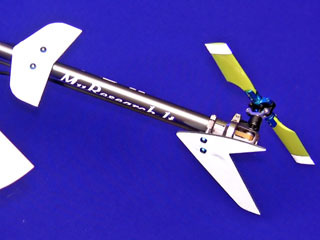 After having selected the precise position, the sensor is fixed on the frame of the helicopter with the help of the double-sided sticky tape and the ties. Two feeding wires of the red (+) and black (-) color, outstretching from the device, are to be connected to the feeding connectors or to the switch. The range of the feeding voltage can vary between 7 and 25 V (two to six sections of lithium accumulators). Please, observe the polarity while connecting power supply. The lighting elements are connected to the wires, marked as “LEFT” and “RIGHT”. The white wires - the plus of feeding; the black wires - the minus of feeding. After switching-on, light appears for a short time; then it will appear after five seconds. After the second switching-on, the device can operate. 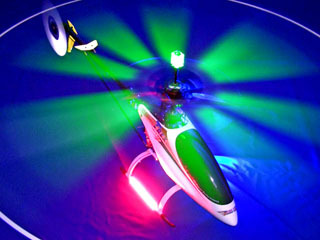 Lighting will appear on rotation of the rotor only. 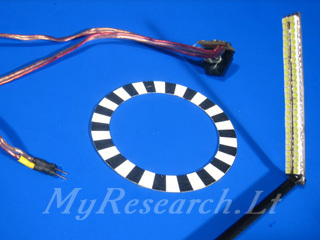 For choosing another shape of lighting the rotor, disconnect and reconnect power supply of the device. After the first switching-on the light, turn the rotor manually for three times during five seconds. Then, after three short flashes, you can choose a shape of lighting. You'll choose a desirable shape on rotating the rotor; each revolution is accompanied by a short appearance of light. The number of revolutions varies between zero and fourteen. If you stop rotation, three short appearances of light will follow after five seconds and the chosen shape of figure will be set. All shapes selectable are provided below. If You wish to turn the figure at 180º, then exchange positioning of the left and right light elements. The duration of operation with a battery depends on the capacity of the battery and the power of the lighting elements. The maximum load current is 5A and if the feeding voltage is 20V; they ensure power of 100W for each of two lighting channels. Such power is sufficient for 2000 ordinary LEDs on each side! We recommend using superbright LEDs of maximum power to ensure the summarized power of 10-20W. The device HeliStrobe, the view from the side of the sensor (the label is on the opposite side). The scheme of installation of the device. 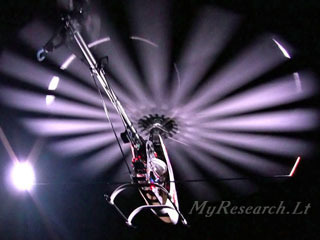 The images of figures formed by the lighted rotor. The numbering of the figures starts from 0, not from 1, that corresponds to the number of revolutions of the rotor required for choosing a shape of the figure. Do not forget that the maximum voltage of the battery exceeds its rated voltage. So, the voltage of fully charged two-section lithium battery is 8.4V, not 7.4V. Because LEDs operate in pulsed mode, the found values can be rounded down: 2 Ohm resistor with power of 1W will be required. The scheme consumes current of 0.7A; this means that seven such schemes can be connected in parallel on each side and the summarized power will be 70W. The light provided by such elements will be stronger than the light of a vehicle's light. 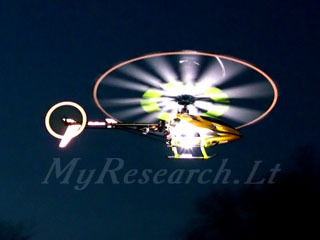 The lighting elements can be fixed to the landing skids - in such a case, the plane of the rotor is lighted very well and the body is lighted partially. To ensure a better lighting of the body, elements can be fixed to a skid fixed aside the body. The skid is made of a carbon tube 1 m long and with the external diameter of 10 mm; the thickness of its walls should be 0.5-1 mm. A tube of a less diameter can vibrate considerably. The center of the tube should be fixed to the frame of the helicopter, and the lighting elements oriented towards the main rotor and the body of the model should be fixed to its ends.